Every year, we look forward to a visit to Uncle Jeremy’s farm. It’s a long journey from our home in Tanzania. Here, my boys learn new things they can do, like picking cherry tomatoes and feeding pigs, and things that are fun but that they weren’t supposed to do, like playing forts with hay bales in the barn (these things they learn from their farm-kid cousins). We get to discuss the merits of blackberries compared to raspberries, instead of comparing mango to passion fruit. This year, we get to help harvest potatoes and carrots. 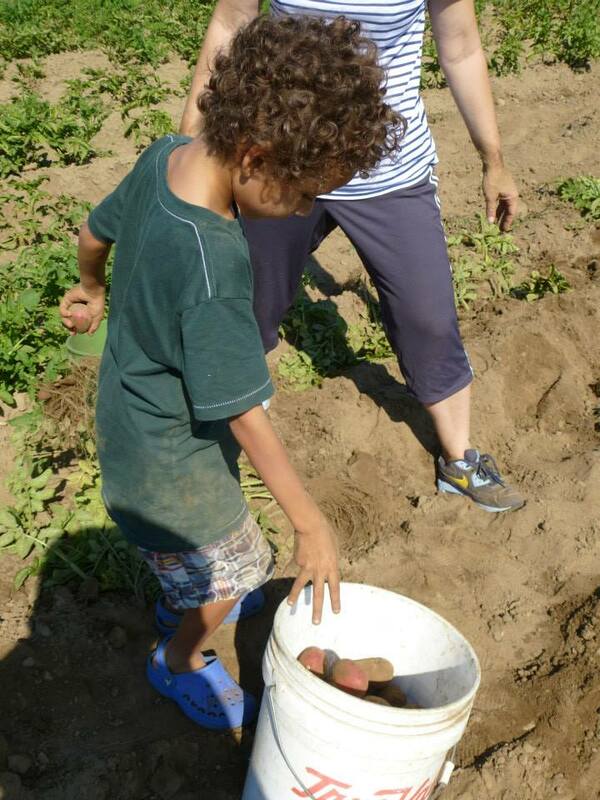 Jeremy has dug up the row of potatoes with the new tractor (Little John), and five year old Tadzio and I work down the row with the crew, pulling up the potato plant, plucking the potatoes out of the roots and digging around in the dirt to find those left behind. The pink potatoes are delightful to find, like an Easter Egg hunt with all pink eggs. Tadzio insists that all of his potatoes go in one bucket, teaming up with Matt who he has pegged as the winning potato picker. He wants to be on the winning team. 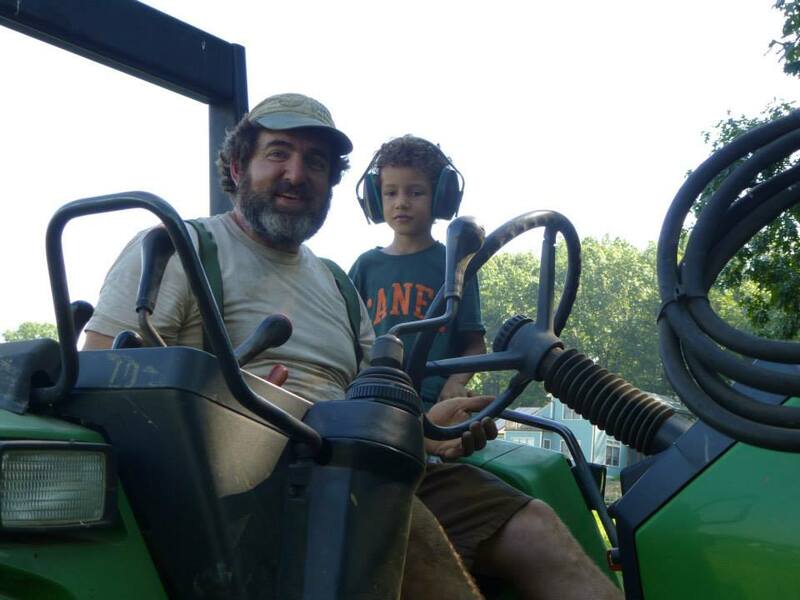 As the crew and I finish the potato hunt/harvest, Tadzio’s eyes shine as he dons ear protectors and rides on the tractor over to the carrots. It’s cool to have an Uncle who is a farmer. Later, with rope around my waist, I spin webs around poles to prop up tomato plants. I think ‘this could be the best day of my vacation.’ The earth breathes dusty heat up at us at the same time that the sun pushes it down on our backs and shoulders, but the dirt kissing my skin over my shoes is warm and silky. Doing farm work is a mineral-scented reminder of who I am, who my family is, and the power of growing food. My boys are growing up proud to have a farm in their family, full of cousins, aunties and uncles who live the farming life. Once a year, we exhale with a loud sigh, wiggle our toes in the dirt and pull carrots from the earth, admire watermelons and lemon cucumbers and red and orange-stemmed chard. We meet the people who support Simple Gifts Farm at CSA pickup, and always think, ‘what nice people.’ Thanks for the farm vacation, Simple Gifts!